To increase our client’s value by creating and managing innovative digital workforces. Success based on executing well-engineered practices, not the result of a collection of random events. Be accountable, committed and customer focused with high integrity, and the business and technical skills to be successful. Maybe no ping pong tables and bean bag chairs but we are proudly a virtual organization providing flexibility in lifestyle. Earning a legacy in helping companies transform themselves and letting our selective group of professionals lead in the implementation of intelligent automation transformation. By building and managing digital workforces, we help companies to get the most out of their most important assets — their people. See below for opportunities to join our team. It's structured so as you build value for yourself, you build value for the company and vice versa. A value structure that builds from your basic needs to accomplishing your aspirations and being recognized for it. Leader of a team of solution and senior solution architects. Accountable for the performance of the team(s) assigned to meet engagement commitments, and provide tactical guidance to team. 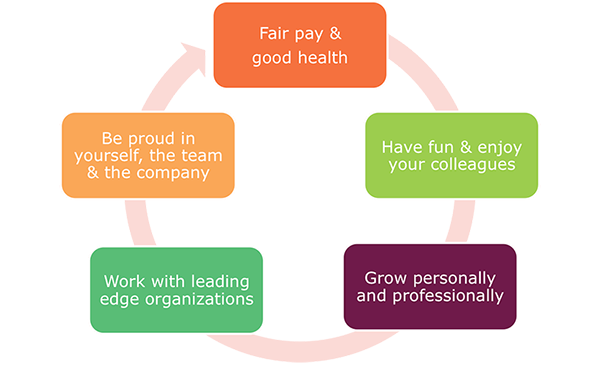 Responsible for performance and career management for the staff on their teams. Expert technical leader to address complex technical challenges in a client engagement leveraging company methodologies, best practices and standard protocols. May lead a team of technical architects. Functional and consultative leader to address complex functional or stakeholder challenges in a client engagement leveraging company methodologies, best practices and standard protocols. Writes functional specifications, reflecting results of business analysis and subsequent re-engineering. Leader of a team of developers, including senior programmers and programmers. Accountable for the performance of the team(s) assigned to meet engagement commitments, and provide tactical guidance to team. Responsible for performance and career management for the staff on their teams. Join our team and help us create massive value for the world's top companies.